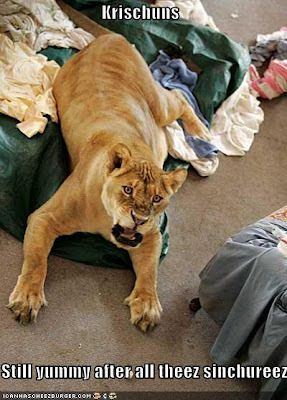 I watched ten minutes of Inside Edition today (first time in my life) because they promised video of Shackle the lioness who rode out Hurricane Ike on the near-epicenter of Bolivar Peninsula in the Crystal Beach First Baptist Church. Turns out, the lion AND the tiger both belonged to the same guy, Mike Kujawa. He has a sort of home-grown zoo there, which in addition to the felines also once had goats and an emu. When it came time to evacuate, Mike knew he could not get both lion and tiger into the same vehicle -- they're not buddies. Mike had raised Shackle since she was a cub and she was human-friendly in a way the tiger (also a female) was not, so he let the tiger loose from her cage to keep her from drowning, but left her inside a fairly spacious enclosure. He and Shackle hit the road, but were unable to leave because of early flooding from the surge before Ike arrived. Tigers are good swimmers and this one survived the storm just fine. As soon as the blow was over, Mike let authorities know about his situation with both big cats and requested help with moving the tiger-- who, in the meantime, was being fed and was definitely not roaming the Peninsula, as news sources had reported. According to a "settings things straight" article from the Beaumont Examiner Online, "Dr. Sarah Matak is the local veterinarian in Winnie, the nearest town on the mainland. She was contacted by officials who requested she tranquilize the tiger so it could be moved to safety. She in turn called Carl Griffith, the former Jefferson County Sheriff and Judge who owns an exotic game ranch down the road. "Accompanied by Texas Game Wardens, Griffith and Matak went to Kujawa’s animal house. The former sheriff and two others cautiously approached the tiger’s enclosure in an attempt to avoid agitating the animal. 'That’s the biggest problem with darting animals,' said Griffith. 'As long as you don’t get them excited, the adrenaline doesn’t start pumping. He went down fairly easily; we got a dart in him and got another dart in him.' (sic -- again, it was a female tiger). Matak said the tiger was transported to an animal refuge facility near Somerville in Central Texas." It seems likely to me that Galveston County's Judge Jim Yarbrough led reporters astray deliberately as to the danger from the tiger, not to make a good story but to discourage unwanted visitors to Bolivar Peninsula. I bet it worked, too. The Inside Edition video revealed how very large Shackle the lioness is -- at 400 pounds, she looked giant next to Mike Kujawa, a well-built man. (The tiger was also 400 pounds.) He said they spent the night of the hurricane on an air mattress on the altar, as shown in photos, "cuddled up and hanging onto each other". The neighbors who brought Mike and Shackle into the church for safety elected to spend the night in a balcony above the altar, from which vantage point all the news photos appear to have been made as well. During the video, Shackle took exception to the camera at one point and began growling, starting to gather herself up. Mike said genially "Let it go" and she settled back down. A minute later, he turned to her and said in the tone we use with small dogs, "Gimme a kiss." She obligingly licked his cheek. I can't even get that kind of sugar from my 7 lb. house cat, Dinah. "The clear implication from this long-time lawman and public official was that it was unlikely people would leave late-model cars and trucks in the path of a destructive storm they felt compelled to flee."